Holiday Countdown is one of the most visually appealing gadgets I have created. 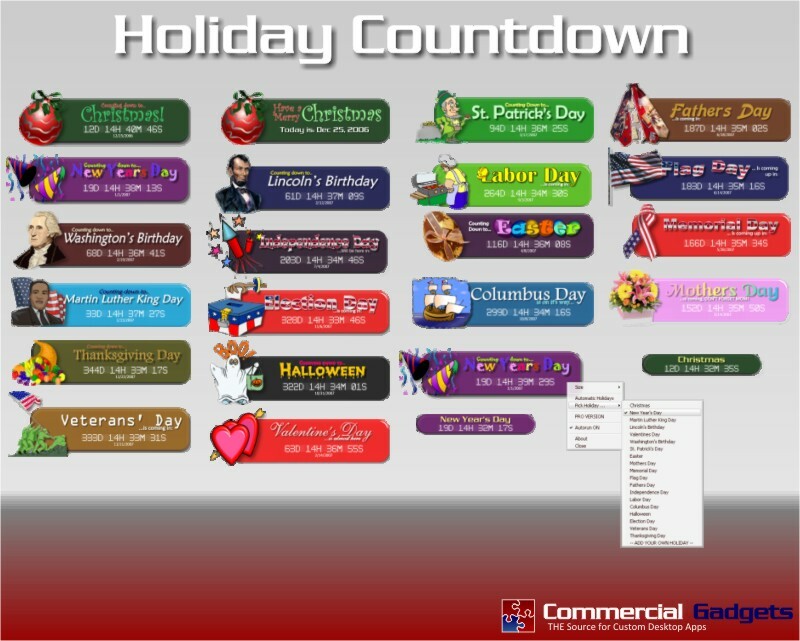 Each Holiday has its own main image and countdown text, as well as text to show on the day of the event. They also have their own color for the background image. Each Holiday has its own MINI mode that shows only the title, and countdown info. Using multiple colors as well. Spelling in the Title of the Gadget! -- Several of the images used are from public clip art galleries -- the rest are my creations. Keep up the great work! I love seeing these new DX gadgets! Holy Cow! This is incredible. Absolutely wonderful. You did a great job with this, and I will enjoy it very much. Thank you! This is simply genius. Excellent. I want the PRO Version. Oh yeah, Pro for sure. Talk about all the Bells and Whistles! Man! I want to thank Zubaz (caugh choke) for all his help and ideas. The main idea for this was his, and he has been very instramental in making this come out as well as it has. Thanks bud! As for the pro version, its in the works, and i hope to have it ready after the holidays. There are plans for another version that would allow you to use your own images, so look for that in the new year. David, this widget is awesome. Good luck with the pro version. I'm going to feature this on my WC site and send all my friends to it! This is awesome! So many holidays! I love it! Thank you very much! This is very cool. Keep up the great work. We Want Pro! We Want Pro! We Want Pro! Excellent Gadget and I really like the " Add your own Holiday "
Wow! RomanDA you have got to be the most imaginative and inventive DXer around. Another excellent product. Yes, that wasn't very rational. (1) Simply got an error using edit function. Disregard. (2) "Take the $" = "Ready to purchase", when it comes out. Exceptional, as always. Running this at boot. My only complaint is with your logo, I think you can do better than that! Or matter run a logo contest? Logo Contest..... Works for me. Company name is Commercial Gadgets --- Make a Great Logo and you will get. 2. The adoration of all. 3. The ability to say "I made that"
4. Zubaz picking it to death! I know this must just be an oversight...but I don't see one in there for my birthday!